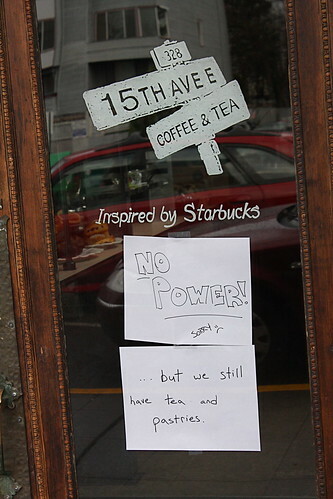 We followed up with Seattle City Light to ask about the power outages that hit Capitol Hill on two consecutive days to start Christmas week. The two outages were not directly related, according to spokesperson Mike Eagan. Monday’s outage was an early morning affair, knocking out electricity for about 3,000 customers for about five hours starting not long after midnight. City Light said a cable failure was to blame. Tuesday’s outage was a little more impactful. About the same number of customers were affected but the outage stretched out for about seven hours before the lights came back on around 1 PM. Eagan said Tuesday’s failure was caused by old wiring near 16th and Thomas. The connections where a line attached to an insulator near the pole failed, knocking service out to thousands. “There’s old equipment in use throughout Capitol Hill,” Eagan said. City Light is spending about $2 million on an upgrade of Capitol Hill’s grid but pockets of old gear are still in use across the area. Eagan said recent work on a substation on Bellevue Ave revealed transformers that were installed prior to World War II. Eagan also said that recent problems with Metro’s electric trolleys in the area aren’t related to the outages. “We are not seeing an increase in bus issues,” Eagan said. Saturday night, there were several reports of Metro’s electric trolley’s experiencing technical difficulties. We’ll try to check in with Metro to see if there’s anything unusual going on with the trolley’s from their end of things. With the upcoming big rate increase I hope S*ity Light plans to replace this pre WWII stuff so the power doesn’t go out like it did on Bellevue Ave/Pike-Pine before Xmas, not once but twice in the same night. You’ve clearly spent little time with PSE. Yeah, that extra .07 cents per kilowatt hours is gonna just kill you, isn’t it?